Mordian 7th Regiment: Heresy Era Iron Hands - Army Pic Ahoy! A very [insert your preferred festive greeting] to you all! Hope that as the year draws to a close, all of you lovely readers out there are warm, safe and happy! 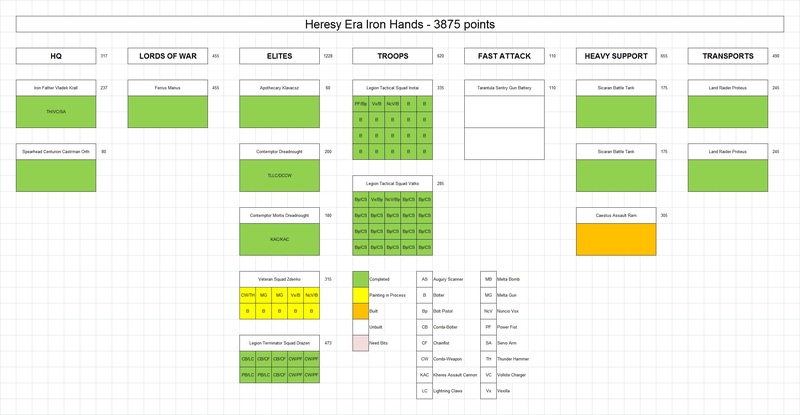 I've had a few days off from work (or as near to a day off as I can actually get) and in between doing some last minute shopping and whatnot I pulled out all of the Iron Hands that have been painted so far, and took some time to update the painting chart. I didn't realize quite how much infantry there was until I laid it all out! Big units seem to be the order of the day in 30k, with the weapons available, casualties come fast and furious. I avoided the lighter transport vehicles for that very reason, the two tactical squads are carried to battle in Land Raiders instead! The Sicarans are designed to take care of the massed enemy infantry, and should be able to knock out any skimmers and light vehicles. A pair of Contemptors (one Mortis with the Kheres cannons and one 'vanilla' with Lascannon and Powerfist) were thematically appropriate, as the Iron Hands are known to utilize them heavily. The Iron Father and the Terminators are slated to get a Caestus to transport them around, but for now will be relying on the 2-in-6 chance of the warlord trait providing them Deep Strike. Most terminators in the heresy-era ruleset do not get the Deep Strike special rule as standard, which came as a surprise. The army also includes a 20-man unit of quasi assault marines (one of the tac squad options is to replace their bolter with a close combat weapon for free), who are joined by an Apothecary to help keep 'em in the game with FnP. Ferrus will usually join that unit as well, as he's too bulky to ride in the Caestus with the terminators. Surprisingly close to the finish line with the army! One ten-man squad of vets, the Caestus, and a pair of counts-as tarantula turrets that are still inbound and it'll be complete! ...Until I get a unit of Immortals. ...And maybe a Spartan. Hah! That is a a very impressive festive spread (Also I read the title as chip ahoy because I think I am hungry prepping xmas eve dinner). 'Maybe' a Spartan? So, a when will you start on the Spartan. Looking very nice and it has been quick to get this far already. Absolutely fantastic: bloody well done, and merry Christmas! They look amazing all together! You are a machine in how fast you can turn around an army! Flippin'awesome. Great stuff. I second it - you are a painting machine! Very impressed mate. So much FW goodness. Merry Xmas over and again. Looking forwards to seeing the Spartan and cestus ! @Rictus: Thanks! Painting to a deadline really kept me motivated to crank 'em out! @Admiral Drax: Cheers, mate! And a merry Christmas to you and the family as well! @John Stiening: I appreciate it! @Dai: Thanks, mate - it's a whole mess o' resin, that's for sure!